My first ever foreign holiday (bar a school trip to Holland in sixth year) was a fortnight in Kavos on the Greek Island of Corfu. It was the summer of 1991 and I traveled with a dozen newfound friends from my first year at Uni. Admittedly the majority of the time was spent drinking, but I also got my first ever taste of 'foreign food'. At that point you'd never have even thought about taking a photo of your meal. The 36 exposures were far too precious to waste on such frivolities. However I do recall tzatziki, stifado, deep fried squid, stuffed vine leaves, olives, taramosalata, and moussaka. 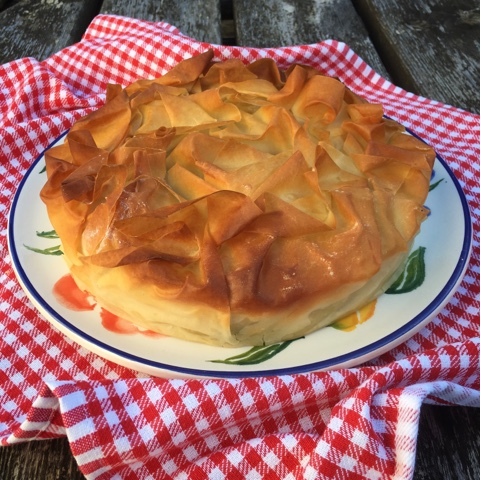 But the dish I took home and have recreated in various shapes and forms ever since was Spanakopita and I'm delighted to have teamed up with James Villas to share my version of the iconic Greek dish. Over the years I've discovered that one of the best things about going on holiday is discovering a new culture, and particularly trying the food. Part of what makes a villa holiday so much fun is the freedom that self-catering offers. You have the flexibility to dine out in a local bistro, indulge in some Michelin starred cuisine, or even try your hand at recreating local delicacies in your home from home. James Villas have teamed up with chef and author Jo Pratt to create a range of #MyHolidayDish recipes to take you on a gastronomic tour of the destinations where they have Villas. I'm a huge fan of Spanish Tapas and Jo's quick and easy Pepper & Goats Cheese Tarts have gone straight onto my must make list. Washed down with a large glass of Sangria of course! Back to my own dish. One of the problems that I faced when attempting to recreate authentic Spanakopita at home is the sheer quantity of spinach that you require. What seems like a huge bag disappears to nothing when cooked. In the recipe I'm sharing below I've bulked out the traditional spinach and ricotta filling with basmati rice. For speed and convenience I used a packet of pre-ccoked rice. I reckon it could be seen as a nod to rice stuffed vine leaves. The Greek flavours are encapsulated further with the inclusion of olives, mint and lemon. Bon Appetite! Or Καλή όρεξη! (Kalí óreksi!) as they say in Greece. Place the damp spinach in a large pan and let it wilt down over a low heat. Drain well in a sieve or colander, squeezing to remove as much moisture as possible. Roughly chop using a scissors or knife. 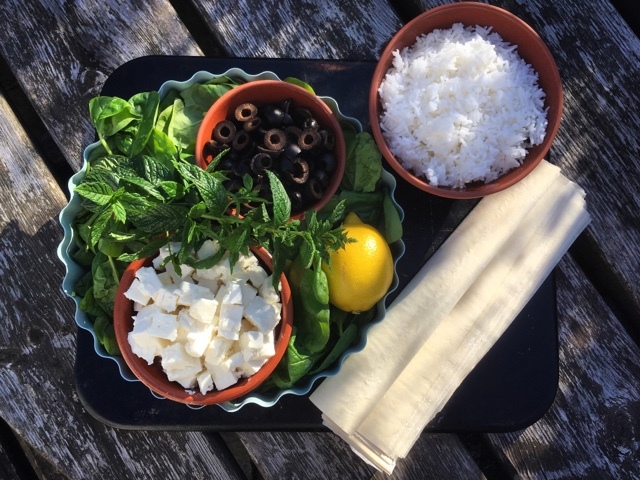 In a large bowl mix together the chopped spinach, sliced olives, shredded mint leaves, lemon zest and juice, rice and cubed feta cheese. Combine well and season with freshly ground salt and pepper. Brush a 25cm loose bottomed quiche tin with melted butter. 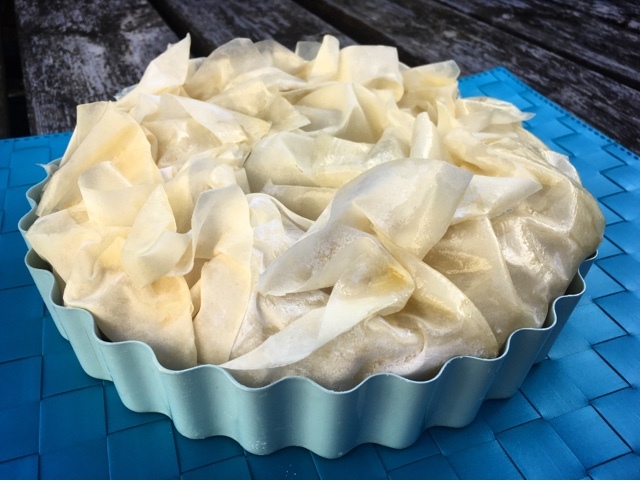 Lay out the filo pastry sheets and lightly brush the top one with butter. Carefully place it in the quiche tin to line the base with an overhang at each side. The pastry doesn’t have to fit in smoothly – a few wrinkles and folds in it are fine. 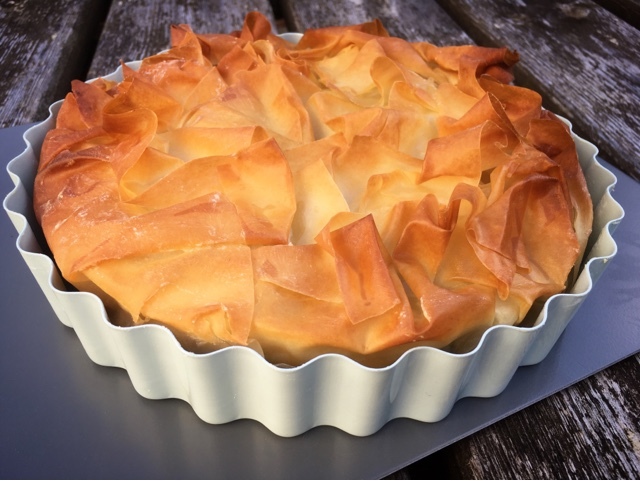 Brush the second pastry sheet with melted butter and this time lay it down into the tin the other way round, so it drapes over and lines the base. Repeat the criss-cross layering with 6 out of the 7 butter brushed filo sheets. 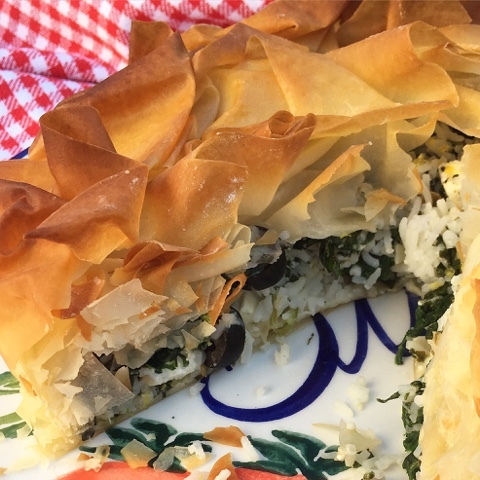 Spoon the spinach, rice and feta mixture into the pastry lined tin. Crumple the final sheet of filo to cover the top then fold in all of the other pastry to form a parcel. Remove the tin and transfer the Spanakopita to a serving plate. Can be served warm or cold, ideally with minted yogurt, a Greek salad and a glass of Ouzo! Disclosure : This is a commissioned recipe for James Villas. As always, all views expressed are my own. Oooh, I've never had a spanakopita, or been to Greece. Time to update my bucket list! Oh you are totally missing out. On both counts! When we went island hopping around Greece in May, we ate this every day, sometimes twice a day. I would happily still eat it every day at home. Island hopping sounds much more sophisticated than my Greek Island experience! I'd happily eat this daily too but not sure my waistline could cope with all the pastry and cheese. Great tip with the rice! I always find that with spinach as well. A whole 500g bag wilts down to a few handfuls! Thanks for pointing out my typo. Yup where on earth does all the spinach basis to?! Without a doubt my favourite thing about travelling is the food. Too often you think you're eating Spanish, Italian, or Chinese in this country to discover its actually fusion food and nothing like the real deal at all! This recipe looks fantastic. We've holiday on and off in Greece for the last 10 years and have eaten this lots of times! One of the first things I learned at a cookery lesson in Singapore last year was that there is no such thing as Singapore Noodles! I absolutely love spanakopita! 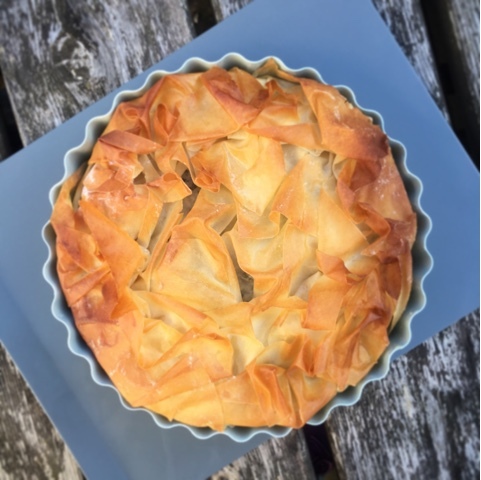 I plan to include in my new course on baking savory pies - so thanks for this beautiful post! Oh that sound like my absolute ideal cookery course. Pretty much any savoury pie is heavenly in my eyes. I haven't had spanakopita in such a long time! Hope that I've inspired you to to have some spanakopita again sometime soon. 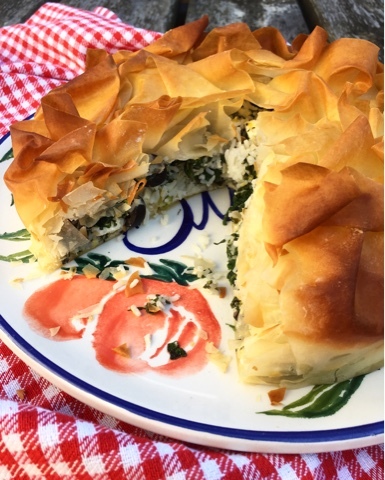 Gorgeous spanakopita!! Flaky, golden and delicious!! I absolutely adore flaky golden filo pastry. I really want to go back to the Greek Islands now to enjoy the food properly. Don't think I could stand the pace of Kavos these days!!! Greek food is so amazing. Even without the plate smashing! Yes spinach disappears as much as mushrooms do when they cook. Good idea to add rice to bulk it out. Thanks for submitting it to Meat Free Mondays. I featured your recipe this week. The amazing vanishing vegetables! Thanks for including my recipe in your roundup.